In a world where natural habitats are increasingly fragmented, we need to ensure dispersal and connectivity among the remnant patches in order to reduce biodiversity losses. A common way to do this is by protecting "wildlife corridors" that link national parks and other protected areas into a network. But how do we figure out where corridors are most urgently needed? I am studying mammals in the network of protected areas across Borneo, trying to understand the dynamics of the meta-community and to assess where landscape connectivity is most important. This topic is interesting from a basic science perspective, as a fusion of meta-community theory and landscape ecology could greatly enhance our understanding of spatial ecology. Clearly the topic also has major conservation applications. For the last 5 years, in parallel with my field research, I have been helping to build a consortium of stakeholders (academic, NGO, government, and industry) interested in regional conservation in Sarawak, Malaysian Borneo. My major partners in this are Dr. Mohd-Azlan Jayasilan (Universiti Malaysia Sarawak) Drs. Jason Hon and Henry Chan (World Wildlife Fund Malaysia), and Olga Helmy (Univ British Columbia). At a recent forum, we presented our recommendations for wildlife corridors to the Chief Minister of Sarawak. 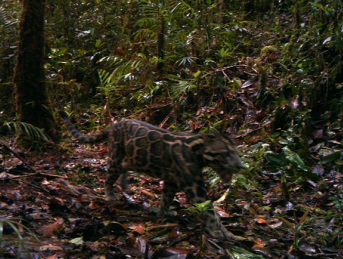 Our top priorities are a couple of extensions to the new Baleh National Park, recently proposed in the area that our research identified as the most important for connectivity in all of Borneo. The park itself and the extensions will help ensure wildlife dispersal between the Hose Mountains (Sarawak), Betung Kerihun (Kalimantan), and Kayan Mentarang (Kalimantan). Baleh and the proposed extensions add only 1% to the protected area coverage of Borneo, but my analysis suggests that they reduce the chances of extinction by an average of 10% across all larger mammal species by enhancing regional connectivity. I'm excited to keep working at the science-policy interface in Malaysia, and also to export this analytical approach to other areas. Over-harvest is one of the most serious threats to tropical vertebrates worldwide. “Bushmeat” hunting has reduced or eliminated mammals and birds in many areas, leading to "empty forests" that are structurally intact but lack large animals. Indeed hunting rates of large vertebrates across the tropics are almost always unsustainable. This negatively impacts more than just the hunted animals themselves. For example, many tropical plants depend on vertebrate animals for pollination or seed dispersal. The loss of these animals also deprives humans living in these forests of food and culturally significant icons. We are working to combine modern wildlife management techniques with traditional ecological knowledge to generate "win-win" situations where both humans and forest animals prosper.This involves interviews with hunters in remote villages and demographic simulations to optimize the sustainability of hunting strategies. Limiting the near-term impacts of climatic and other global changes depends on understanding the resilience of ecosystems to altered environmental conditions. My lab and I are using long-term monitoring with camera traps, seed traps, and drones (with multispectral and thermal sensors) to assess how variation in tree physiological condition and seed production, such as that driven by El Niño and climatic changes, impacts animal abundance, diversity, movement patterns, and productivity. Many climate change studies and conservation plans focus on how rising temperatures or altered precipitation will directly affect organisms. But it is likely that such abiotic changes will be much less important that interactions between novel environmental conditions and human behaviour. For example, as forests dry out they could be more accessible to logging, or more susceptible to human-lit fires. Understanding such interactions will be critical to limiting climate change impacts, and is a focus I hope to develop in my lab. The biogeography of Southeast Asia affords unique opportunities to experimentally assess the ecology and community assembly of animal communities. The western islands of the Indo-Malay archipelago are biogeographically Asian while to the east, across "Wallace's Line", the Australasian fauna of Wallacea and New Guinea are dramatically different. Here, Asian primates, carnivores, and ungulates are replaced by Australasian marsupials and ratite birds. Curiously however, across this same line, tree composition changes only slightly. My lab and I use camera trapping at sites spanning the entire archipelago to assess whether vertebrate assemblages with very different biogeographic histories converge, in similar environmental conditions, in terms of representation of different guilds or overall biomass. We also assess top-down community regulation by comparing herbivore populations in islands with and without predators. Finally, we can examine several aspects of niche theory by analyzing populations of monkeys, pigs, deer, and civets on islands where they are not native but where the habitat may be highly suitable. As large vertebrates decline and are lost across the tropics, we are left wondering what will happen to the trees whose seeds those animals dispersed. We have surprisingly little ability to predict these cascading impacts, mostly because we still do not fully understand whether animal-mediated seed dispersal matters to the demography and evolution of plants. On the one hand, the vast array of fleshy fruit types that tropical trees have evolved suggest that, at some level, seed dispersal is clearly important. Moreover we know that many trees suffer demographically when their seed dispersing animals are lost. But on the other hand, certain tree species may persist for millennia after their dispersers vanish, and other species display no apparent ill effects in ecological time when deprived of their dispersers. As a way to assess the demographic and evolutionary importance of seed dispersal, we are once again taking advantage of the unique biogeography of insular Southeast Asia, in this case to assess the evolutionary and ecological importance of vertebrates for tropical tree demography, community dynamics, and trait evolution. We combine large-scale natural experiments with smaller-scale controlled manipulations and quantitative modeling of demography and community dynamics. We study the same tree taxa in similar climates and forest types, but exposed to very different animal assemblages, to assess whether and how fruit traits have changed in response to seed disperser assemblages. This will help us assess the evolutionary future for the numerous tropical tree species that are currently losing their seed-dispersing mammals through over-hunting. We also use wire exclosures to determine how different terrestrial vertebrate groups (e.g. elephants vs ungulates vs rodents) affect seedling demography and dynamics.